The BHS Electrical Distribution System (EDS) provides flexible power distribution to all 480-volt, 3-phase components in an Operator Aboard Battery Extractor System, including the Battery Extractor, chargers, and Battery Wash Equipment. 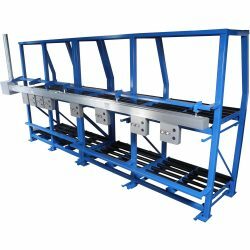 The EDS is a stand-mounted, high-density system that is customized using track busway that can be tapped at any location with a simple turn-n-lock connection. The EDS simplifies the process of powering battery handling equipment by reducing the jumble of cords and providing even, dependable output. Instead of tangled cables and costly add-ons, rely on the EDS to safely power all parts of an Operator Aboard Battery Extractor. The extruded aluminum housing provides a 100-percent ground path, and a dedicated grounding conductor is also available. An optional safety feature connects the EDS to a BHS Battery Room Ventilation System or Hydrogen Gas Detector to disable chargers in the event of excessive hydrogen gas accumulation. Every battery room needs a dedicated Electrical Distribution System—trust BHS to provide yours. Contact our sales team at +1 314 423 2075 to learn more about the Electrical Distribution System or other Electrical Distribution options.